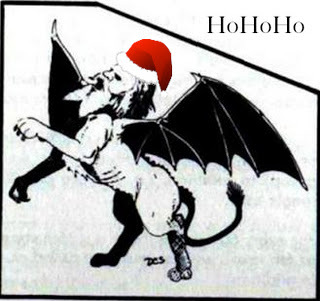 Here’s my Secret Santicore present. I would like a table of 50 Bizarre and Eclectic Urban Locations. One sentence for each is enough. Fantasy genre, please. Gonzo is fine, or simulationary or whatever my Santicore wants to do, really. They don’t have to fit together or relate in any way. 01-02 This puppet show will lampoon the last adventure the players were on. If investigated, there are no puppeteers back there. 03-04 The winner of this alleyway boxing contest get the gold *and* the championship belt (a girdle of gender-change). Previous champs revert to their previous gender after twelve hours. 05-06 Ivy square is covered with sentient ivy, which can detect elves, which it likes to eat. 07-08 A gold coin lies in the middle of Farfield road. It weighs ten tons. 09-10 In the Chapel of the Exalted Philosopher, guest priests from various religions shout fire and brimstone sermons over the congregation’s peels of laughter. The congregation are reanimated dead (though you’d hardly notice unless close). 11-12 At the bottom of the Duke’s private well is the severed head of THE Hydra. In repayment for its being severed, it has poisoned the water of the Duke’s family for generations. 13-14 By ancient custom, if a debtor can lure can lure his creditor into the Public Garden; he is allowed to pay off his debt in blades of grass. (exchange rate 10 blades = 1 silver). 17-18 The Laced Peacock Inn is run by people who always act like they are hiding something awful that just happened in the next room. 19-20 In the back alleys is the secretive Orphan’s Court, where trials are held and harsh sentences passed by magistrates no older than 12. 21-22 The Seelie Market is where the fabulously wealthy send their servants to shop. Local produce of average quality but impeccable ‘magical’ provenance cost in platinum what similar food cost in coppers at your average market. 23-24 Thieves like to lure the city watch to the Slippery Alley and drop rocks on them from above. The new ‘Slippery Alley’ is chosen nightly and the oil is poured at sunset. 25-26 Every Sunday at Painter’s Court, artists hold full-contact portraiture competitions. 27-28 The Wildflower Field is a small cemetery in the old part of town. When buried here, the spirit of the deceased will grow a plant body out of grass and flowers. 29-30 The Hellgate Bridge crosses the river that splits the city into east and west. Anyone walking under it will fall in love with the first living creature they see on the opposite shore. 31-32 A small but eternal fire burns in a back alley. Only four can sit around it, but they are completely warm. Time stands still here. 33-34 There is a section of the old city wall that still stands. All soldiers who have died defending the city go to hell. If you listen to a crack in this wall, you can hear them. 35-36 The Bank of the Smilish will accept deposits and hold them for exactly one year. Interest is paid up front, as one secret whispered into your ear. 37-38 Prudhella’s House is a ludicrously expensive brothel where sorceress/prostitutes use telepathic spells and illusions to enact their customer’s deepest fantasies. For most locals, this experience is too disturbing for repeat business. Prudhella relies on tourists for business. 39-40 Foreign traders run the Wen Shen warehouse. The poor and oppressed can turn to them for food or medical help, in exchange for which they must train in strange grappling games. 41-42 The weathervane over the fountain at Prembly Square points toward the nearest horde of gold (10,000 or more) no matter how far away. 43-44 The soapbox at Central Market has the ability to make d20 people believe anything you say for d10 minutes. 45-46 Once every seven years, the Beauty Tree buds a single flower. Eating it makes one very attractive and raises charisma d4+10 points (but only for those who are ugly and have a charisma under 7). The budding is so regular that it appears on many calendars. Where it is on the tree is not. By custom, no one may attempt to impede another’s efforts to get to the base of the tree on sunrise that day. 47-48 The Charnel Grubhouse will happily dispose of the dead by putting the body in a large box of grubs. Bones are returned a week later. The owner will give you his guarantee that the dead will stay dead and the remains will be unidentifiable. Next door is the Wen Shen silk market. 49-50 The Wen Shen silk market sells silk, but no one knows where or how they weave it in the city (the Wool and Linen Guilds desperately want to know how silk is made). Those who sleep in Wen Shen silk dream the fates of the recently dead. 51-52 Bradmoor the physician will immerse you in a vat of crabs for up to a week. Heal at four times the normal rate. 53-54 Anyone ignoring the ‘Do not sleep on the grass’ posting at Turnhill Downs will be surprised to awaken in a cavern hundreds of feet below the city (none have returned). 55-56 The Good Feeling Well is a public well for the poor. Within twenty feet of it, one cannot help but feel at peace and optimistic about one’s future. The Thorite Church wants it destroyed. 57-58 No one here has heard of a rhino, but you can pay a silver to ride Old Rebus “The unicorn”. 59-60 The Hagfruit Tree in the center of the poor quarter bears fruit year round, meaning those willing and able to stomach it will never starve. 61-62 The Eunuchry of Saint Brigid will modify any willing male regardless of race or age. 63-64 If you touch any statue in Countess Morbella’s statue garden, you must assume its place, while it gets to live again. 65-66 If you let the bees at Igor’s Apiary cover your naked body, they will buzz to you the location of the nearest megadungeon. 67-68 Abraham’s Curiosity Shoppe has absolutely nothing unusual on sale. Everything he has is common and for the usual price. 69-70 The Blessed Cheesemaker sells cheeses that put you in alignment with particular gods. You can completely pass as a believer of any religion for a day after consuming an ounce of the cheese. 71-72 There’s a large wild goose called Black Bertie whose call sounds exactly like a woman screaming in distress. It likes to take out-of-town heroes on a… well, a goose chase. 73-74 The local merchant elite hold a Plumage Festival every year where they run naked through a square while their servants hold ostrich feathers. 77-78 During a brief period of religious tolerance, the burning stake was uprooted and replaced with an ironwood tree. In the trunk and branches can be seen the clear and distinct likenesses of all who were burned on that spot. Efforts to burn or uproot the tree have proven fruitless. 79-80 If you visit the Snail Pits in the south quarter, you can bet on flail snail fights. 83-84 At the Stinking Mermaid, you can get a tattoo that will migrate about your body. 85-86 At the intersection of three alleys is ‘Blind Corner.’ Locals believe if you die here, Owrox the Soul Stealer cannot see you. The city’s poor-but faithful tend to pile up here. The Charnel Grubhouse sends a wagon here every morning to clean up. 87-88 The Duke’s Men operate a greenhouse where they grow and cross many foreign, exotic and dangerous plants. 89-90 The western quarter includes a steep hill, at the top of which is a small crypt. Three shrouded women walk up the hill every night and enter the crypt. No one ever sees them leave. 91-92 Northgate Pitch is gently sloped. Local aristocrats have created a ‘Flight Club’ where they test various contraptions in an attempt to fly from the top to the bottom. Their manservants operate some of the more dangerous ones. 93-94 Seelie (urban faeries) prefer to live among themselves. The local Seelie neighborhood is a giant wasp hive purchased from an eastern merchant. It hangs over the side of the upscale BearStraat Hotel. 95-96 The Duke’s Gaol is an underground prison. Cells on the top level are covered by iron grates, so the public may humiliate their occupants. 97-98 If guided through the sewers by a knowledgeable urchin, you may be able to find The Nostril. A giant sleeps beneath the Eastern Quarter. 99-00 No one is sure who owns the House of Riddles. Legends tell of clever men entering the eastern door and exiting the western door with great riches. In the last sixty years, more than a hundred men have entered, never to leave. Needless to say, we don’t talk about 91-92. Merry Christmas and thanks for the great list! Your Secret Santicore was very kind to you. I love this list. I’m eagerly awaiting my Santicore reply. I wanted the hobbit equivalent of the Borgias/Lannisters. This was really wonderful stuff, thanks so much!